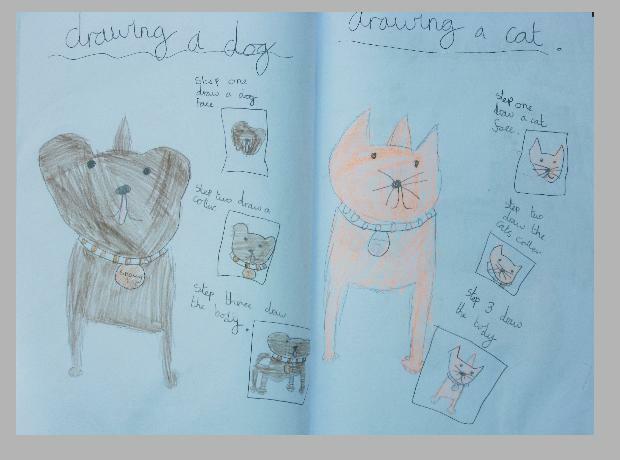 Incorporating literacy into art lessons is a good way of getting children to practice writing whilst completing an art project. Providing step by step instructions with accompanying illustrations will also practice logical thought, as can be seen in this art lesson plan. The teacher may begin with a short quiz in order to prepare the class for the art task ahead. In this case, to put into the correct order various stages of completing a simple task, which might be to bake a cake, to take a dog for a walk, to get ready for school, or even make a cup of tea. Each stage must be put into the correct order. Take the cake out of the baking tray to cool. Mix the eggs, butter, sugar and flour. Place into a preheated oven and bake for 20 minutes. Once the children have successfully completed the quiz, they may think about the task they wish to describe within their art project. They may select any simple task they wish, but to provide simple line drawings along with the written instructions. The following may be used for assessment. Describe the materials needed. Are there any preparatory requirements? Evidence of logical thinking. What comes first? Should the first step come first? Does the next step naturally follow? Does the sequence of stages make logical sense? Could an extra step be inserted to make the demonstration clearer? Are the illustrations sufficiently clear? Great drawing ability is not the aim here, but drawings that can easily be made out. For example, drawings should not be too small or unrecognizable. The accompanying text must possess correctly-used full stops and capital letters. There should be no more than 2 spelling mistakes in the instructions and the writing must be sufficiently clear. Children are encouraged not to make the written instructions too pithy or wordy; 2 – 3 sentences per illustration might be ideal. The placing of each element on the sheet of paper (A3 or A4) will also need to be taken into consideration. Between 6 to 10 illustrations might also be realistic within the time frame. Devising a step by step demonstration comprising written instructions and accompanying illustrations will help kids think logically. What comes first? Which step logically follows? Are the instructions unclear due to a missing step? What comes last? Drawing ability is not the aim here, but simple line drawings that are easy to make out. Accompanying text must relate to each illustration and make logical sense. The writing must be legible as well as the drawings (i.e., not too small or unrecognizable). Writing and illustration instructions not only practices literacy in art but also logical thought. The illustration above shows step by step instructions on how to draw various animals, in this case, a cat and a dog. Children may use reference books for visual resources, but the step by step instructions must be the children’s’ original work. The demonstration package must also be easy to follow. Such an art lesson will help develop cognitive thinking for kids. What are the best art brushes for oils?